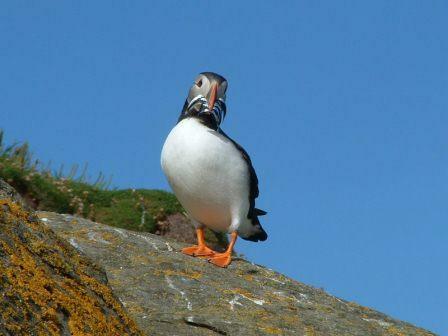 The seabird monitoring programme surveys seabird populations across Shetland and has been carried out since 1978. Factors such as the innate mobile nature of birds, migration patterns and their vulnerability to floating oil slicks and illegal discharge from passing tankers have all been taken into account when designing the programme. The programme also complements similar survey work conducted during the breeding seasons by Scottish National Heritage, the Royal Society for the Protection of Birds and by Fair Isle Bird Observatory Trust. Winter counts of diving seabirds and seaducks. Beached bird surveys – monthly surveys of beached seabirds on selected beaches. If any oil is present on the birds, then it is analysed to identify the origin and possible source of pollution. Supplementary monitoring – contribution to surveys carried out on the Island of Foula relevant to SOTEAG’s needs. Northern Fulmar Fulmarus glacialis, Population counts of the Northern Fulmar were very similar to the 2017 counts. Mean breeding success across the four monitored sites was similar to the 1985-2017 average. European Shag Phalacrocorax aristotelis, Population counts at Sumburgh Head and No Ness were similar to 2017. Breeding success at Sumburgh Head and Burravoe was higher than in 2017 but Sumburgh was below the average for all monitored years whereas Burravoe was above it. Black-legged Kittiwake Rissa tridactyla, Population count at Compass Head was 45 nests, compared with 46 in 2017. Mean breeding success across six monitored sites was high and well above the 1988-2016 average. 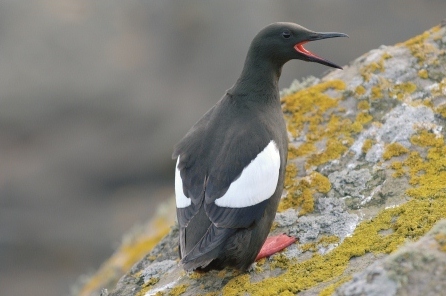 Common Guillemot Uria aalge, The monitored populations had increased since 2017. The mean population index was 50% higher than in 2017. Breeding success was higher than in 2017 and equal to the 1989-2017 average. Razorbill Alca torda, Population counts were higher than in 2017 at all monitored sites, but the mean population index was was below the 1976-2017 average. Breeding success was similar to the 2011-2016 average. Two coastline transects for Shag population monitoring were added to the monitoring programme. Two coastline transects including more nests for Kittiwake population monitoring were added to the monitoring programme. Changes in population counts since the most recent surveys were variable, although the long-term pattern at most sites is stability. Population surveys of the monitored area in Northmavine confirmed 16 breeding attempts, down from 23 in 2017. Breeding success per breeding attempt was up from 2017. In the Yell Sound and Sullom Voe monitoring areas there were 297 birds compared with 201 in 2017. However, the yearly average between 2009-2013 was 605. Hascosay, Bluemull and Colgrave Sounds and South Unst were surveyed on 2nd January in perfect conditions. Numbers of Common Eiders and Great Northern Divers were similar to recent years, but counts of Cormorants, Shags and Black Guillemots were considerably higher that during the 2016/17 survey. fuel oil and 1 was crude oil, likely of middle-eastern origin. Percentage of oiled birds on Shetland’s beaches continues to be amongst the lowest in Europe. There were no instances of abnormally high mortality of any seabird species during the year. Operations at the Sulllom Voe Terminal and its associated tanker traffic have not any detrimental effects on Shetland’s seabird populations. Please follow this link for recent Ornithological monitoring reports, or Contact Us for earlier reports.